Are These Vine Weevil Eggs? We think that a little education on this subject is over-due. Vine weevil are a native woodland species that loves to munch on young fibrous roots whilst it is in its larvae stage. It then grows into a ‘robotic walking’ weevil which likes to eat semi-circular chunks from the leaves of many adult plants. They are a real pain, difficult to control as they can only be effectively treated with insecticides or natural predators at the larvae stage. When developed into weevils they are cunning in their hiding places, resistant to a lot of insecticides, non-appetizing to wildlife and able to cover great distances in their pursuit of food. Why do we not have many problems with them? Commercially for a number of years the trade has used a vine weevil deterrent chemical in our composts. 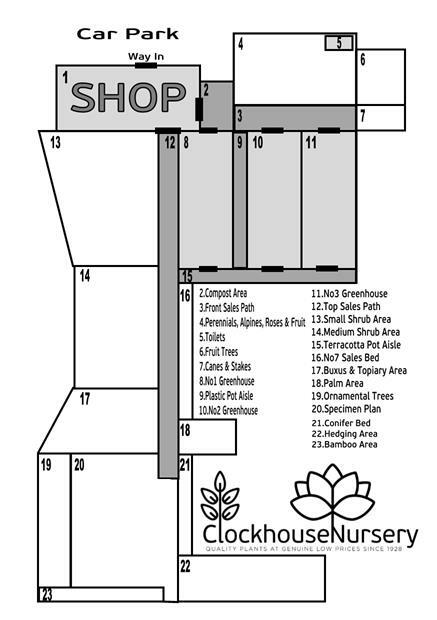 This ensures a period of breathing space so that our young plants can establish their roots without something gobbling them. This is why we ‘very rarely’ have any problems with the larvae. 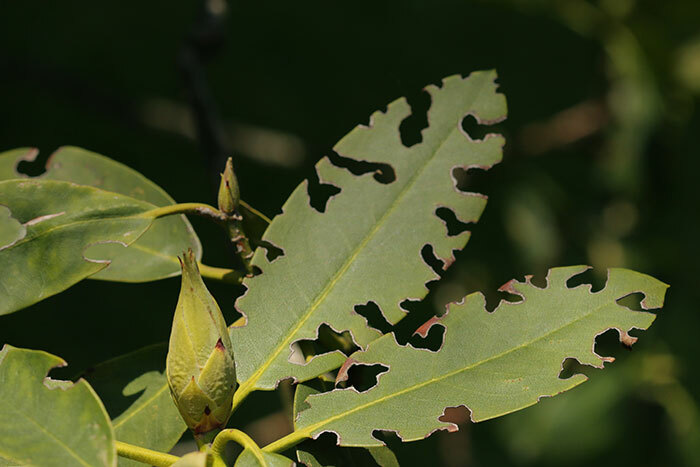 However we, like you, cannot defend against the weevil attacks on foliage and being surrounded by gardens and woodland, we cannot eradicate them from our nursery completely. 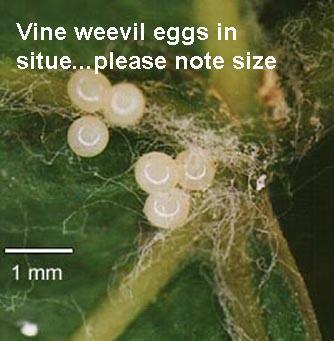 Vine weevil eggs are very…very small, less than 1mm and are not easy to see with the naked eye. 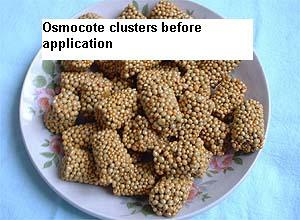 What people have normally noticed in their compost is Osmocote. This is a commercially used and publically available slow release fertilizer. 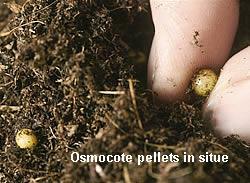 Hard, orangey-brownish yellow pellets contain the fertilizer and when these become moist, they swell slightly and become translucent yellowish green in colour. The moisture, coupled with correct ambient temperature, allows the pellets to release fertilizer at a controlled rate throughout the growing season. It is applied using two different methods. Individual pellets are mixed within the compost mixture or when low nutrient composts are reaching the end of their fertilizing stage, tablets (lots of pellets glued together) can be pushed into the compost near the surface. 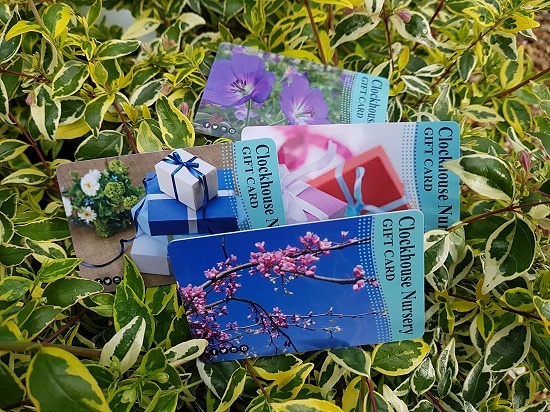 Many customers in the past have complained about their plants dying and then go on to reveal that they have rummaged through the compost, disturbing the root system, to remove the ‘vine weevil or slug eggs’ that were in the pot with the plant. Of course root disturbance of this degree will often result in a dead plant. How to treat if you do find some. There are two main methods for treating vine weevil at grub stage. 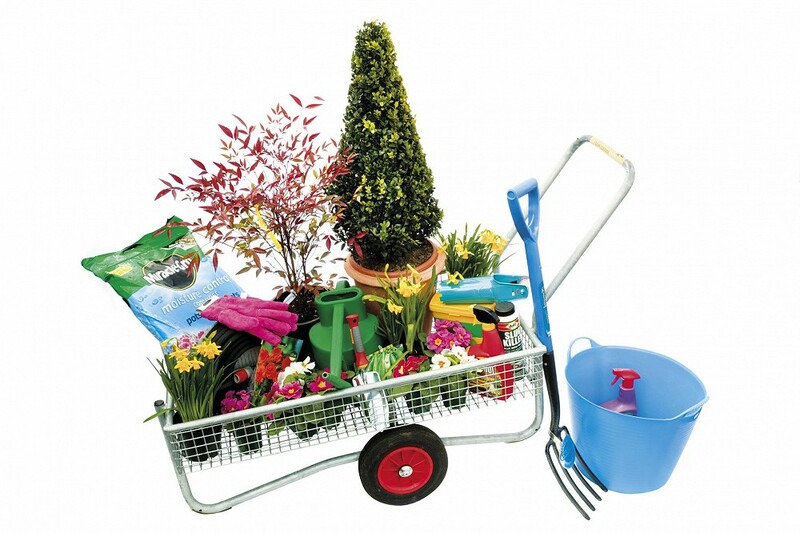 You can buy a liquid insecticide designed to drench the soils in containers which will need to be applied once the weather warms up during the spring & possibly once or twice more during the summer. There are also natural nematode applications which are microscopic predators of the vine weevil. 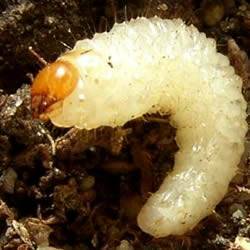 They are applied in dilution to the soil of pots or gardens & then they actively prey on vine weevil grubs. Once they have done their job, they perish, so annual application is necessary. There is another method, but it usually comes too late after most of the damage has been done to root systems. Manually pick off & crush the adult beetles. This will at least help prevent them from mating & producing new eggs for the next generation. Unfortunately the adults tend to be more active from dusk onwards making them extremely difficult to spot. 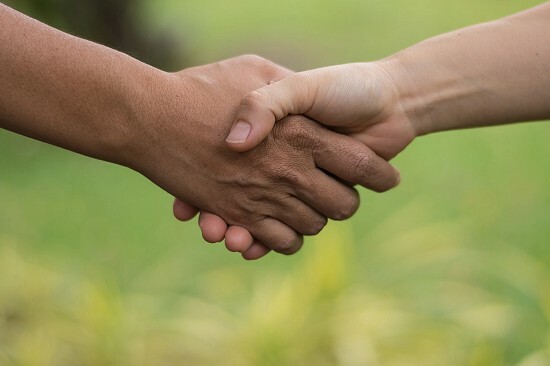 We hope that this information will prove helpful in re-assuring you that we are not in the habit of knowingly spreading nasty little troublesome insects among our customers. Lily beetle and its larvae are leaf-eating insects of lilies and fritillaries. 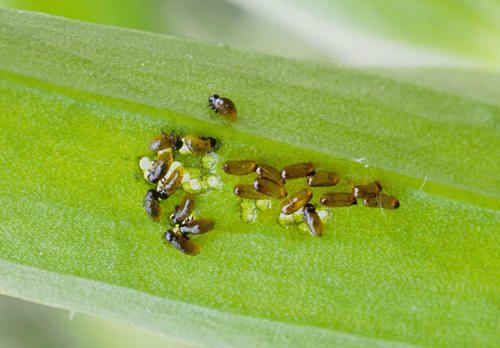 The adult beetles are very occasionally found on other plants but lilies and fritillaries are the only plants on which eggs are laid and the grubs develop. 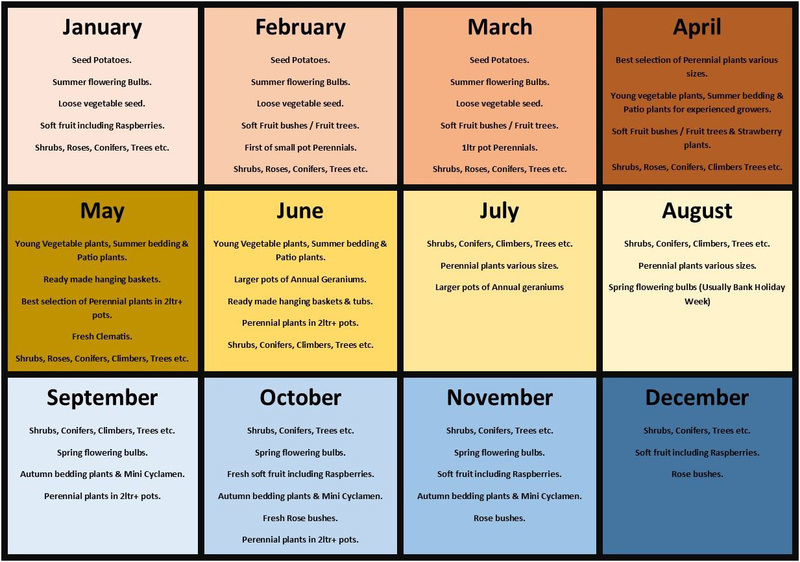 Apart from spoiling the plants’ appearance, attacks in early summer can result in undersized bulbs developing, which may not flower next year. Lily beetle has become widespread in the UK over the past three decades. 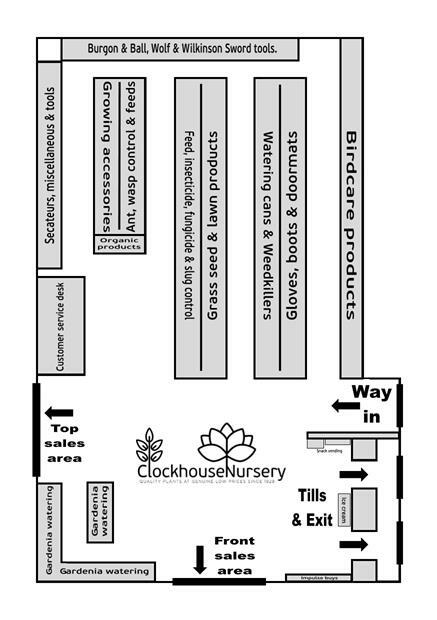 Where only a few lilies and fritillaries are being grown, the plants should be regularly inspected from late March onwards so that adult beetles, larvae and eggs can be removed by hand. Pesticides are likely to be more effective on larvae than adults Heavy infestations which are impractical to remove by hand can be treated with pesticides Organic insecticides containing natural pyrethrins (e.g. Bug Clear Gun for Fruit or Defenders Bug Killer, ecofective Bug Killer (also contains fatty acids)). Several application of these short persistence products may be necessary to give good control Synthetic pyrethroid pesticides such as lambda-cyhalothrin (e.g. Westland Resolva Bug Killer), or deltamethrin (e.g. Sprayday Greenfly Killer) can be used The systemic neonicotinoid insecticide acetamiprid (e.g. 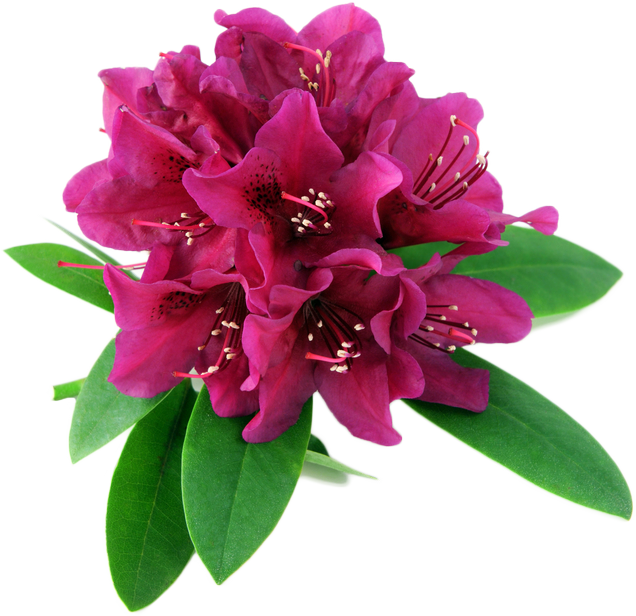 Bug Clear Ultra) can also be used Plants in flower should not be sprayed due to the danger to pollinating insects. 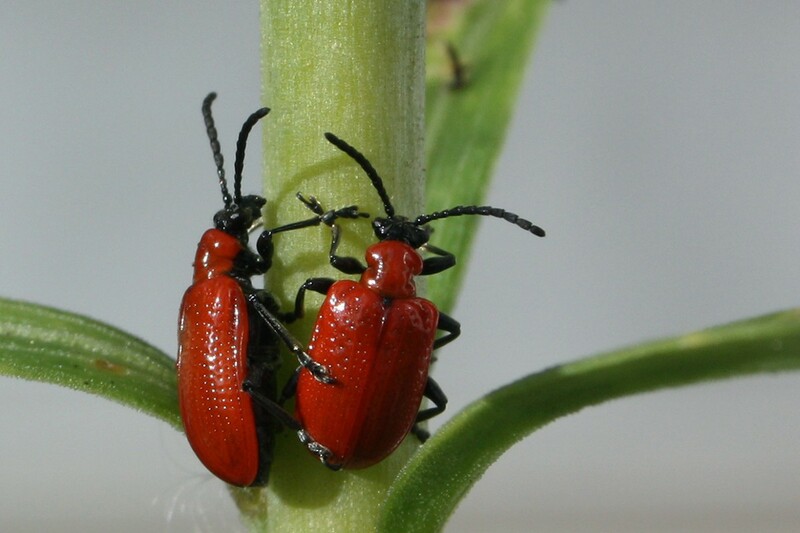 Red lily beetle overwinters as adult beetles in soil, leaf litter and other sheltered places. This could be anywhere, not necessarily in the vicinity of lilies and fritillaries. Consequently, there is no advantage in attempting to treat the soil below lily plants. The beetles begin emerging on sunny days in late March and April when they seek out the foliage of host plants. 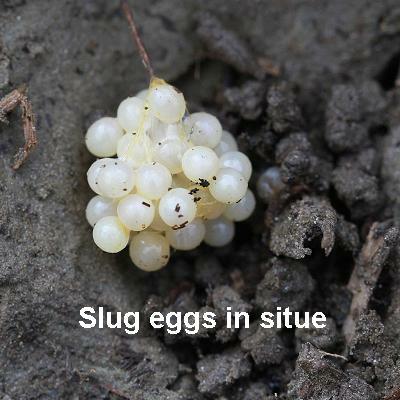 Eggs are laid in small batches on the underside of leaves during April to mid-summer. 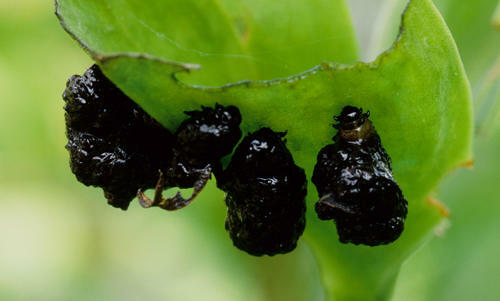 The eggs hatch and the larvae feed on the foliage. When fully fed, the larvae go into the soil to pupate. The next generation of adult beetles emerges from mid-summer onwards. These beetles add to the feeding damage but there is only one generation a year and these late summer adults will not mate and lay eggs until the following year.